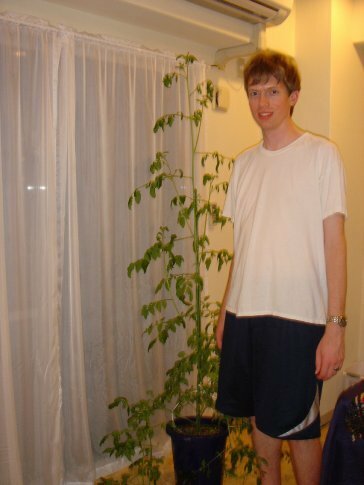 Yes, indeed, Bob, our cherry tomato plant has had lofty goals. He is now taller than Brandon's 6'6"! I have a good idea as to why your plant Bob got so big but produced very little fruit. I believe you have used a potting mix with too much nitrogen and not enough phosphorus. High amounts of nitrogen are essential for leafy and flowering plants. Fruiting plants however require only some nitrogen but high amounts of phosphates for production of fruits such at tomatoes. Hope this helps you if you grow again next season!